Immediately behind the hut a trail leads up through the trees to the ridge. Follow it and turn left on the ridge top. A faint trail is discernable on the top. It disappears rapidly and a large rock slide appears. Essential items for this trip: Tent, walking stick and emergency beacon. 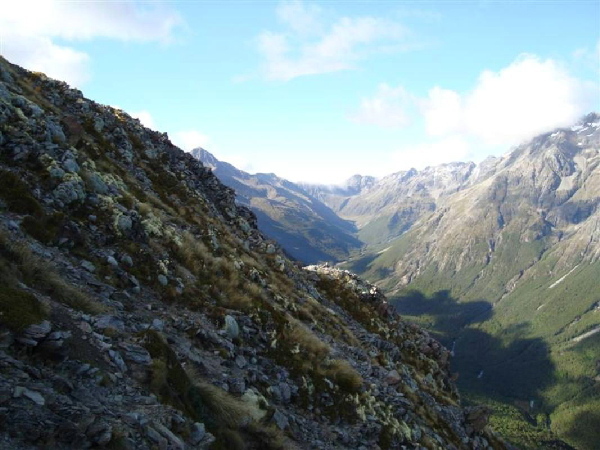 I departed from the John Tait hut at approximately 830 am on the morning of 31 Dec 2010. Arrived at the Cupola Hut between 11 and 1130 am after a hot and tiring climb. 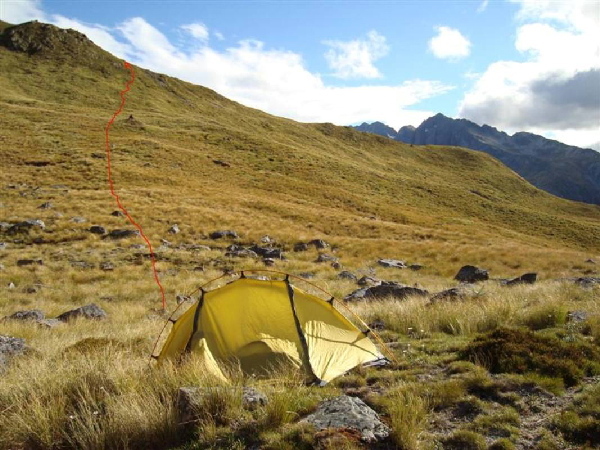 (In retrospect one should spend the night at the Cupola Hut, as it is better to start in a refreshed state prior to commencing the climb up to Gunsight pass. Negotiate the rock slide with care, as many of the boulders are insecure. Your target is the hanging valley (cirque) in the far distance. Try to contour relatively high as you make your way along this part of the route. A stream flows down from the cirque on the left hand side. The direction of travel is to the immediate right of the stream. The route up into the cirque is marked in the photo. 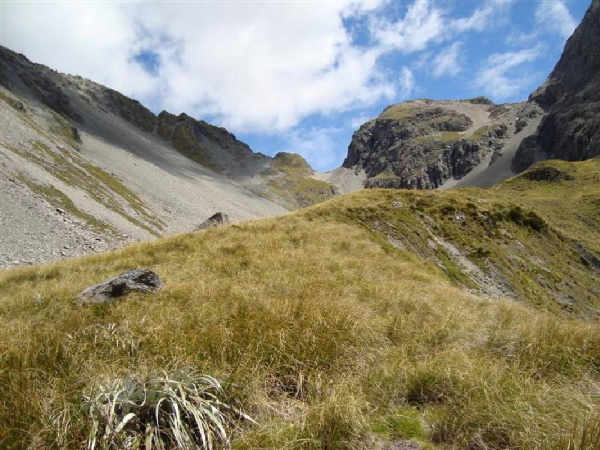 Note that the tussock grass is lumpy through this area and you need to be aware of the potholes. (Thus the need to carry a stick to continually check foot placement). A number of small streams flow off Mount Cupola on the immediate right. Water flows through most of them and I drank on a regular basis to prevent dehydration, as it was a hot day. 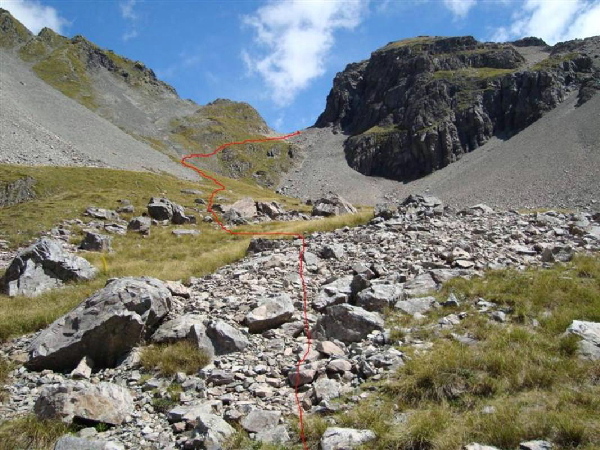 Allow yourself about 3 hours to get from the Cupola Hut to the top of the Cirque approximately where the red arrow ends. (Note I stopped to make myself a hot meal midway on the climb to the top of the pass to re-energise myself). This would probably not be necessary for someone commencing the climb from the Cupola Hut. Once you top the ridge you will be presented with this view. Your target is the gap in the far distance. Allow an hour plus to get from this position to the top of the pass. 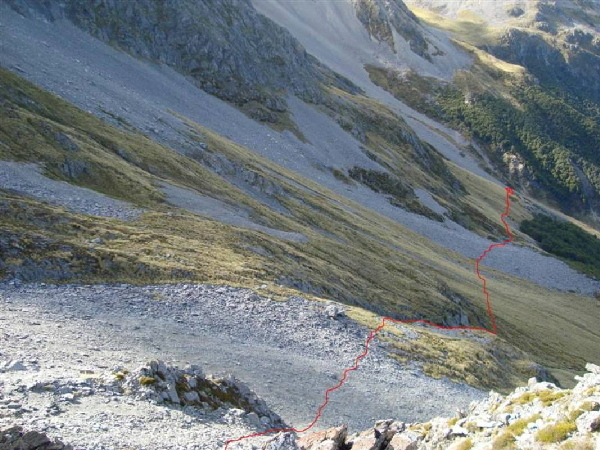 The route I took up to the pass is marked in the photo. A small stream flows through the middle of the basin to the right of this photo. Take the opportunity to fill any half empty water bottles as it is a fair distance once through the pass to the next water source. 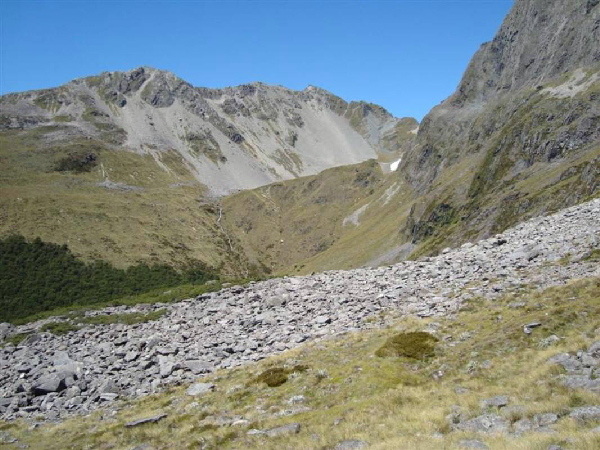 Use the tussock slope on the left hand side of the pass as this provides best traction as opposed to a direct approach up the rock slide. The view from the top of Gunsight pass into the East Sabine valley is breathtaking and makes all the sweat and toil worthwhile. Mount Franklin is the distant peak in the middle of the photo. Note - this photo does not adequately show the extent of the drop off down the gravel slide to the immediate front. It is very steep. I reached the top of the pass at about 430 pm after a very strenuous day. 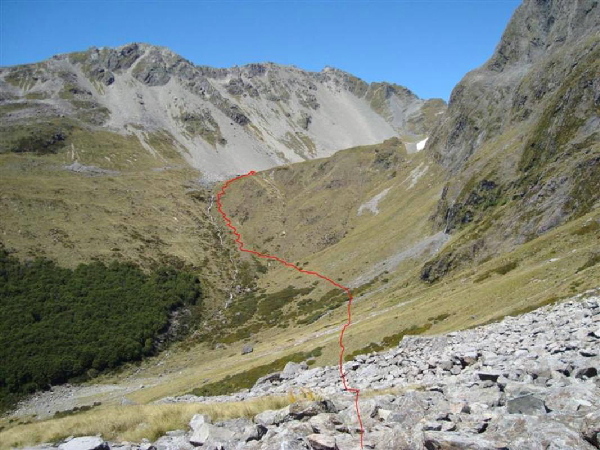 My destination was the plateau in the middle distance immediately after the ravine leading down into the bushline where I camped for the night (end of the red line). In walking time this took about another hour and a half. 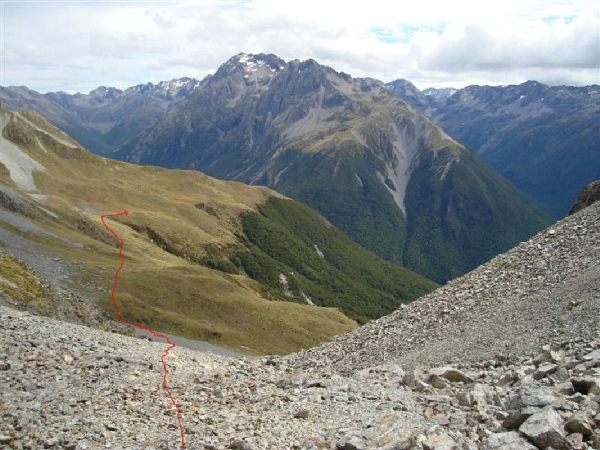 Head down the gravel slide to the front (old footprints are visible to track) and then gradually start contouring to the left. I positioned my campsite for the night on the edge of a bench, which runs along the side of the ridge. There are plenty of spots to rig up a tent in this area. In the morning I followed the route shown in red. The route I followed was too low on the ridge as it led me to some very steep bluffs, which were difficult to negotiate. I strongly recommend that anyone walking this route takes a much higher contour when heading south along this ridge. Veer to the left of the red line and climb to get oneself into a more favourable position. These are the bluffs that you will need to avoid. I had to climb uphill to get myself out of trouble as the slope was becoming too dangerous to traverse. This view is looking south down the East Branch of the Sabine River. 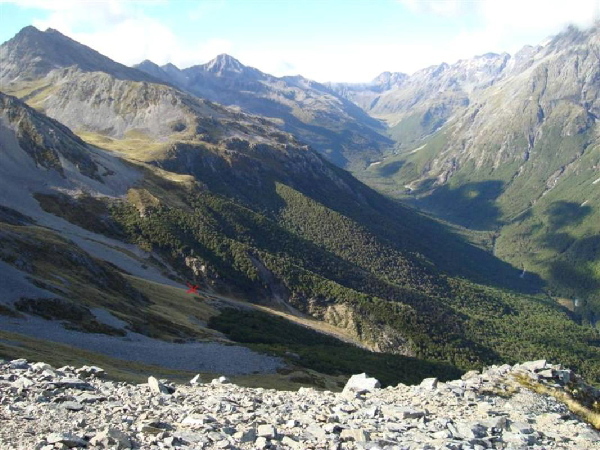 The Travers Saddle track is further down the valley to the left in this photo over the ridge in the immediate foreground. Once you cross the final ridge as you negotiate your way along the edge of the mountain this view should present itself. Your objective is the red cross indicated in the photo. This is the Travers Saddle track which runs down a long scree slope towards the East Branch of the Sabine River. I followed a stream down the side of the mountain as shown. Try to avoid the Spaniard grass which is numerous in this area. There are however a number of ways to drop down to link up with the track. 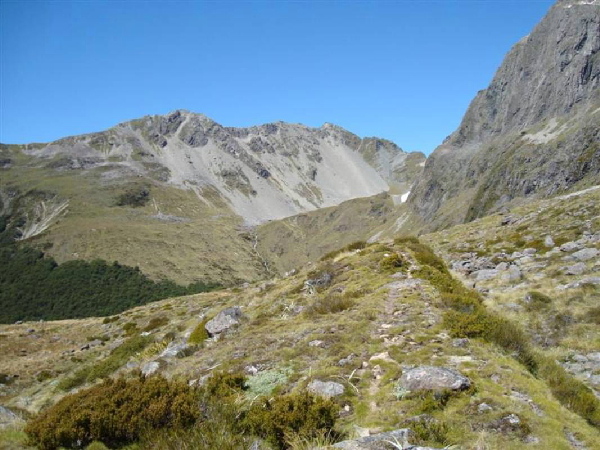 (Note � it took me about 4 hours from my camp site to link up with the Travers Saddle track as shown in the photo below). I trust the above pictorial description of the route is informative. As mentioned earlier if you are intending to walk this route alone you should carry an emergency beacon. I would recommend carrying one even if you are in a group. A stout walking stick is also essential.